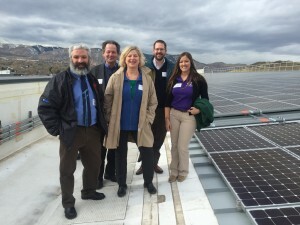 Missouri University of Science and Technology visits the National Renewable Energy Lab in Denver, CO through a Solar University Network trip. The Solar University Network (SUN) is an initiative of the Midwest Renewable Energy Association (MREA) with support from the US Dept. of Energy’s SunShot Initiative. Second Nature is a subgrantee providing support and guidance on this initiative. With nearly $450 billion in foundation investments, US universities represent a large potential source of investment to advance the growing clean energy market nationwide. Investment in solar photovoltaic (PV) systems can provide myriad benefits to universities including energy savings, applied learning, research, resiliency, investment diversification, advancement of sustainability goals, and further engagement of alumni and donors. MREA and Second Nature, together with the Sunshot Initiative and the National Renewable Energy Laboratory, are piloting an approach with 9 Universities that leverages the experience of MREA’s national solar technical assistance team through professional development events, the facilitation of campus solar development teams, training, and direct technical assistance. Together these organizations are supporting unique student learning and results-focused teams that will create solar roadmaps for their institutions in order to implement real projects. Leverage the experience of MREA’s national solar technical assistance team to help university stakeholders realize the benefits of solar and renewable energy by establishing and supporting Student Solar Engagement Teams, developing University Solar Roadmaps, and defining strategies for endowments or foundations to make investments in solar power. The Midwest Renewable Energy Association (MREA) promotes renewable energy, energy efficiency, and sustainable living through education and demonstration. The MREA is working to protect the environment by educating the public about appropriate use of natural resources to meet our energy needs. Each year they organize the Energy Fair, an event that brings over 15,000 attendees together to learn about clean energy and sustainability, connect with others, and take action towards a more sustainable future. The Energy Fair is the longest-running event of its kind in the nation. The SunShot Initiative is a program within the Office of Energy Efficiency and Renewable Energy at the U.S. Department of Energy. SunShot seeks to make solar energy cost-competitive with other forms of electricity by the end of the decade. It funds cooperative research, development, demonstration, and deployment projects by private companies, universities, state and local governments, nonprofit organizations, and national laboratories to drive down the cost of solar electricity to $0.06 per kilowatt-hour or $1 per watt (not including incentives). Five years into the decade-long SunShot Initiative, the solar industry is already more than 70% of the way to achieving SunShot’s cost target. NREL is a national laboratory of the U.S. Department of Energy, Office of Energy Efficiency and Renewable Energy, operated by the Alliance for Sustainable Energy, LLC. NREL focuses on creative answers to today’s energy challenges, develops clean energy and energy efficiency technologies and practices, advances related science and engineering, and provides knowledge and innovations to integrate energy systems at all scales. From breakthroughs in fundamental science to new clean technologies to integrated energy systems that power our lives, NREL researchers are transforming the way the nation and the world use energy. The case study series “Solar University Network: Innovation in Solar Energy Finance & Development” highlights higher education investment in solar energy projects. The purpose of these case studies is to showcase working financial models for universities and other higher education institutions to invest in solar energy on campus. See other resources from these projects at www.solarendowment.org/resources. Appalachian State University: Supporting Solar Energy through a Student-Financed Renewable Energy Initiative. Wake Technical Community College: Public College Foundation Investment in Solar. Colby College: Developing a Diverse Solar & Carbon Neutrality Strategy. Second Nature and MREA presented at the 2016 Smart and Sustainable Campuses Conference. You can see details and presentations on the Solar University Network’s website. Using Campus Solar Deployment Roadmaps to Guide University Investment: The Midwest Renewable Energy Association (MREA), Second Nature, and TurningPoint Energy have developed an approach with four Midwest universities to define opportunities for on- and off-campus solar investment through a Campus PV Deployment Roadmap. In this panel, participants will hear presentations about the roadmapping process in general, specific incentives to universities and students, financial modeling and assistance offerings, and first-hand experience from one of our pilot universities. Read our blog about the impact for students from campuses that have gone through this program. Second Nature and MREA will partner with the Intentional Endowment Network on a series of activities including a webinar and fall workshop to support clean energy investments by higher education.